Why should bagels have all the fun? 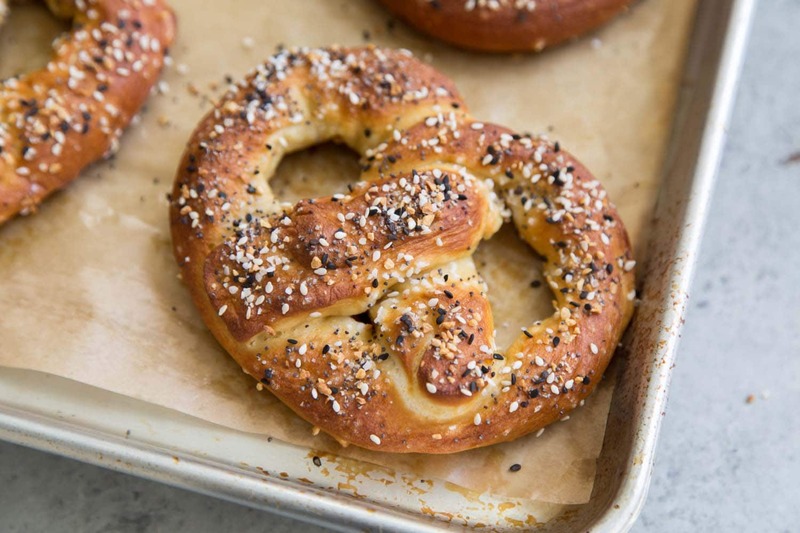 These everything pretzels are topped with black and white sesame seeds, poppy seeds, dried garlic bits, dried onion flakes, and coarse salt. As baseball season winds down, every Dodger game is crucial. My husband and I have been glued to our couch, praying for a Dodger victory, and obviously, snacking. Instead of my usual homemade microwave popcorn, I’ve been venturing into other snacks. I recently bought the infamous Trader Joe’s Everything but the Bagel Sesame Seasoning blend. And then this delicious bread happened. How can you not like everything? The combination of flavors in an everything bagel hits all the right spots. It’s salty and savory and incredibly delicious with a schmear of cream cheese. Let’s translates those iconic toppings to a soft pretzel! I highly recommend watching this pretzel shaping video. It’s a one minute video that does a great job visually showing the shaping process. Working with one strip at at time, stretch and roll dough strip to about 2o-inch long. Shape into a “U” or horseshoe. Cross the two ends over each other twice, leaving a circle at the other end. Take the ends and secure to the bottom of the circle. How do pretzels get their iconic golden brown color? Traditional pretzel dough is first dipped in lye and then baked in the oven. Lye, also known as caustic soda or sodium hydroxide, is an alkali (meaning it has a pH greater than 7). 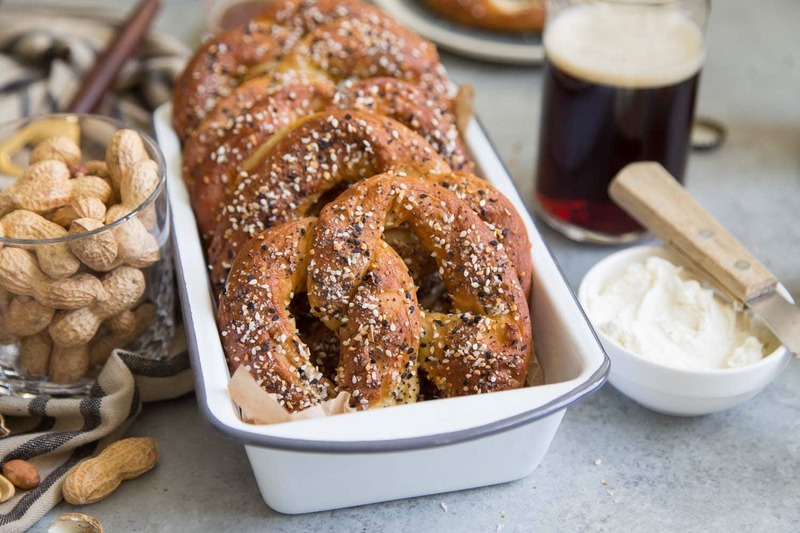 Lye water gives German-style pretzels their iconic color, sheen, and crust. Asides from pretzels, lye is also for bagels, Chinese moon cakes, and a few Filipino desserts. It can be difficult to procure food grade lye. The next best option: baking soda! Baking soda has similar chemical properties as lye, thus producing a similar golden sheen. Honestly, baking soda is much safer (lye can burn the skin!). 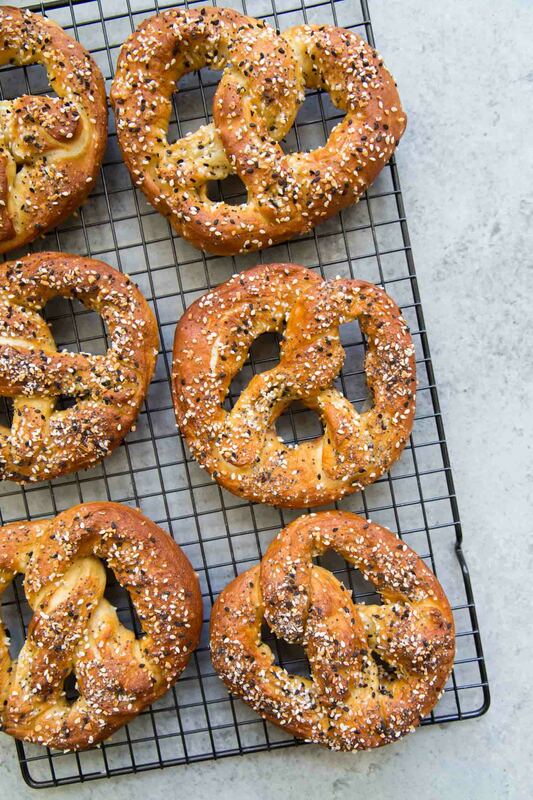 These everything pretzels are best enjoyed the day they’re baked. 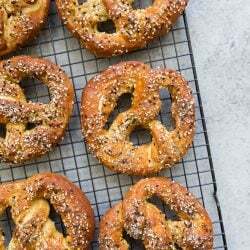 Serve them with classic pretzel accruements like mustard or beer cheese. But since these are EVERYTHING pretzels, they’re absolutely wonderful with cream cheese! 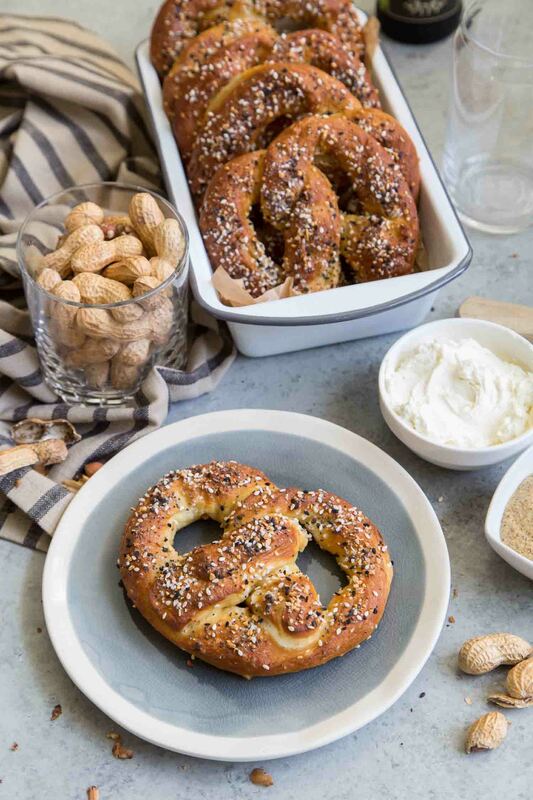 These everything pretzels have bite, chew, and they’re packed with in your face flavor. You’ll definitely have garlic-onion breath afterwards. 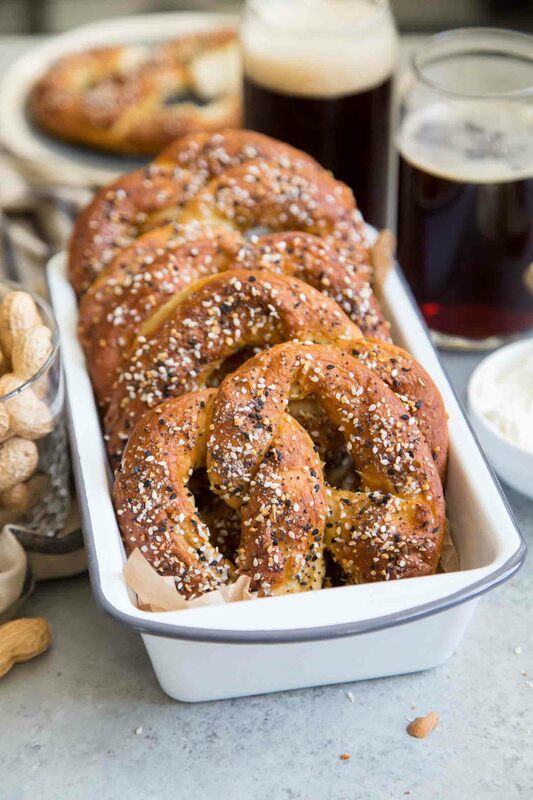 If you’re interested a more subdued pretzel, try these honey beer pretzels. Soft yeasted pretzels topped with everything seasoning mix. The pretzels are quickly boiled in baking soda water and then baked in the oven until golden brown. Whisk together warm water, yeast, sugar, and milk in the bowl of a stand mixer. Allow to sit for 5-7 minutes to activate yeast. Attach dough hook to stand mixer. Add bread flour and salt. Mix on low speed until dough starts to come together. Add melted butter and increase to medium speed. Mix for 3-5 minutes until the dough is smooth and no longer sticks to the sides of the bowl. Transfer dough to a large greased bowl. Cover and allow to rest at room temperature for one hour, or until doubled in volume. Punch dough down to remove air bubbles. Transfer dough to a lightly floured work surface. Pat and stretch dough to a rectangle about 12-inches wide and 6-inch tall. Using a pizza wheel cutter or knife, cut dough into 12 stripes (1-inch wide x 6-inch tall). 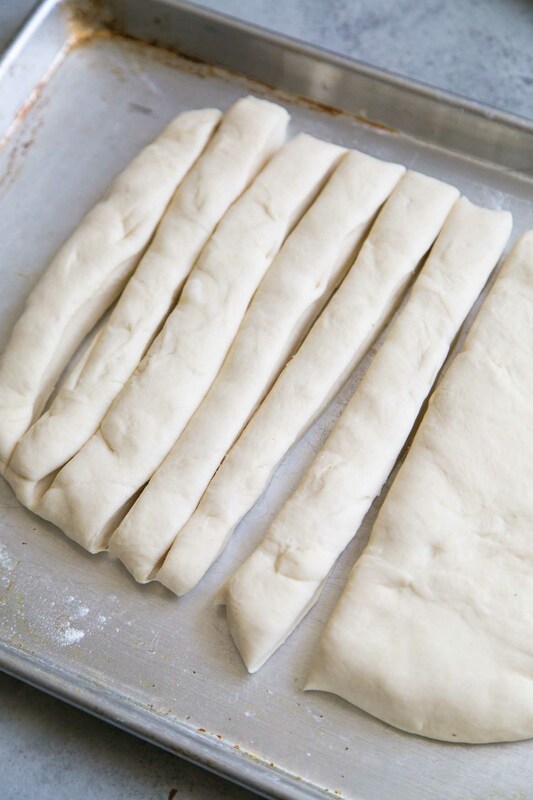 Loosely cover dough with plastic wrap or kitchen towel. 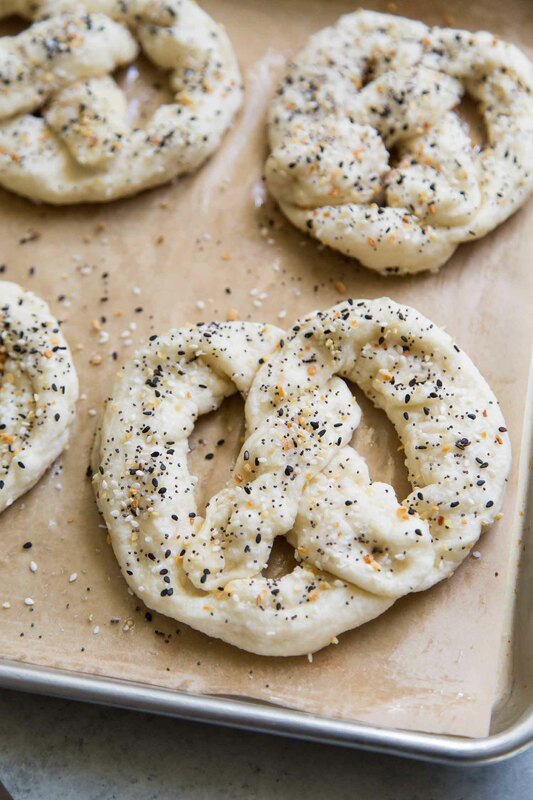 Allow shaped pretzels to rest covered for 15-20 minutes. Meanwhile, preheat oven to 400 degrees F and prepare boiling mixture. In a large heavy bottomed sauce pot (dutch ovens work best), combined water and baking soda. Set over medium heat and bring to a boil. Grease two baking sheets with cooking spray or butter and set aside. Once mixture is boiling, place 2-3 pretzels seam side down into liquid. Boil each side for 20 seconds. Strain and place pretzels seam side up onto prepared baking sheet. Repeat with remaining pretzel dough. Once all the pretzels have been boiled, generously sprinkle pretzels with everything seasoning mix. Bake for 18-20 minutes until pretzels are golden brown all over. Remove from oven and allow to sit in pan for 3 minutes. Transfer pretzels to a wire rack to cool. Enjoy pretzels warm. These pretzels do not keep well. Eat them the same day they are made. Water can be used in place of milk. Simply substitute the same amount of water. To make your own everything seasoning mix: toss together 2 tablespoons white sesame seeds, 2 tablespoons black sesame seeds, 1/4 cup poppy seeds, 2 tablespoons dried onion flakes, 2 tablespoons dried garlic flakes, and 1 1/2 tablespoons coarse sea salt.